On New Year’s Eve, December 31, 2015, Indiana’s Court of Appeals, in the matter of Harris v. Orange County Highway Department, et al, reaffirmed the precedent that employment handbooks generally do not create enforceable employment contracts. Daniel Harris argued that the employment handbook at issue in his case was unique and created a burden on the county to show just cause before it could terminate his employment. Indiana’s Court of Appeals rejected this argument and affirmed summary judgment. In reaching its conclusion on Harris’s contract argument, Indiana’s Court of Appeals focused on whether the handbook made a clear promise of employment security. The Court of Appeals noted that a case in Illinois, Duldalao v. Saint Mary of Nazareth Hosp. Ctr., 505 N.E.2d 314 (Ill. 1987), laid out the elements in Illinois (not Indiana) on when an employment handbook may be considered an employment contract. The first element requires that the “handbook contains a promise clear enough that an employee would reasonably believe that an offer had been made[. ]” The Court of Appeals then addressed Indiana’s precedent on this issue, which has again and again failed to find that handbooks constitute enforceable contracts. For example, the handbook in Orr was not a contract because, among other reasons, it contained a disclaimer that clearly stated that the handbook was not a contract. The handbook in McCalment was not a contract because internally contradictory provisions failed to show a clear promise of employment security. 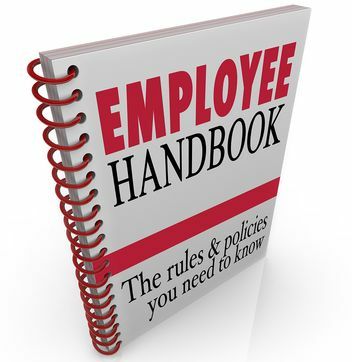 The handbook in Wynkoop was not a contract because the language was not specific enough to provide employment security and because other provisions emphasized the at-will status of employees. The lesson here is that the vast, vast majority of handbooks in Indiana will not transform an at-will employee into a contract employee. The handbook must be read as a whole, keeping in mind the Court’s preference to find at-will status, and the handbook must contain an unequivocal promise of employment security (just cause for adverse actions and a duration of employment). Anything less will result an inability for a terminated employee to bring a breach of contract action.